Thank you, R.G. 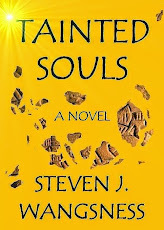 Sciandra, for your review of Tainted Souls on Amazon: "One of the best mystery books I've read. More twists and turns than a mountain trail with endless dead-ends. Brilliantly written, fast paced and almost impossible to put down." Doesn't get me any closer to being dead-tree published, but still . . . The latest review on Amazon of Tainted Souls was unusual enough that I thought I would share it with everyone. "This is a great book for those of us thinking that honour is a concept of days gone by," "rachel" writes. "It is easy to do the right thing. It is difficult to know when to do it." I applaud her for grasping one of the book's underlying themes. It's always nice to see that someone gets what you're going on about. How about you? Has any review of your work really struck a note?